Jennifer Forsberg, is an artist living and working in the south of Sweden. 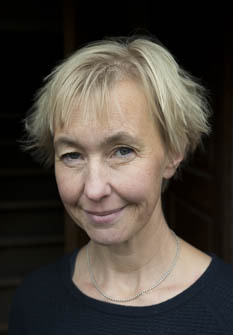 Forsberg holds an MFA in ceramics from HDK at the University of Gothenburg. Her work has been in numerous exhibitions nationally and internationally, most recently in Yingee Ceramic Museum in Taipei, Taiwan ,at European Ceramic Context, Bornholm, Denmark and Homo Faber in Silpakorn University in Bangkok, Thailand. Residencies include Archie Bray Foundation, Montana USA, European Ceramic Work center, Den Bosch, The Netherlands and FuLe International Ceramic Art Museum in Fuping, China. In addition to her studio practice she is teaching, critiquing and supervising in art schools throughout Sweden, as well as Norway and the USA. Forsberg works with a wide range of ceramic techniques and materials. Her work has been described as raw and direct, but also as poetic and multilayered. She often works in a narrative way, where the physical behavior of the materials mix with well-known forms and attributes. Her practice includes both large scale site specific public art commissions and studio work for exhibitions and galleries.